The Lassig dish set from Wildlife Elephant includes a plate with four partitions, a bowl, a spoon and a cup with a handle on each side. 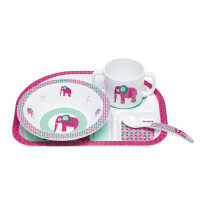 Product information "Dinner Set, Wildlife Elephant"
The bowl and cup with two handles and additional sippy cap are also available separately. 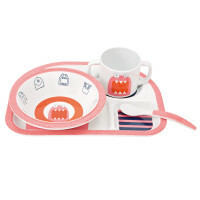 Matching plates, breakfast boards and utensils (spoon and fork) can also be purchased individually.